About a year ago, The Hangover Part II hit theaters and bewildered a nation — or, at least, its movie critics — with its rote repetition of every single joke, beat, and plot twist of the original Hangover. It also went on to pull in $581 million internationally, over a hundred million more than the first installment did. Meaning: This third movie, now officially announced for May 24, 2013, was inevitable. After the brutal experience of sitting through Part II, it’s hard to get psyched up for another Hangover. But generally, this announcement bears good news. For one, all principal players will be returning. (Well, Justin Bartha isn’t officially announced as being onboard. Is he sick of not getting to have any fun?) And the new production is at least hinting at some switch-ups. 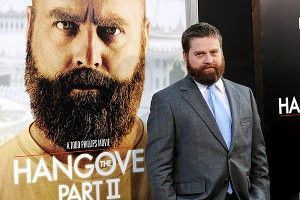 Says director Todd Phillips, who will once again co-write with Craig Mazin, in a statement: “I’m so excited to embark on another ‘Hangover’ film with Bradley [Cooper], Ed [Helms] and Zach [Galifianakis]. We’re going to surprise a lot of people with the final chapter we have planned. It will be a fitting conclusion to our three-part opera of mayhem, despair and bad decisions.” Surprise people! Yes, please do! I certainly don’t want to trash the original writers, because they came up with a great idea and a great concept. But if you look at the original script — and the only reason I’m saying this is because Jeremy Garelick is a phenomenal writer and he gave so much of himself. We sort of disappeared for four months and really rewrote this movie: Mike Tyson was not in the movie, there was no tiger, there was no baby, there was no cop car, there was no brother-in-law that came on the trip. We’re not talking about “tweaks” to the script; we’re talking about massive rewriting. But the Writers Guild has these insane rules that if you’re also a director on the movie, you have to prove this insane amount of work — and they have very nebulous rules of what that work is. Could the second Hangover’s similarities, then, be Phillips’s way of reminding everyone that this was his style all along? Either way, now that he’s gotten the knockoff mentality out of the way — and gotten another half billion in the books — he can, hopefully, relax and get truly weird for this third and last one. Look, if you can’t bring yourself to believe in the Hangover franchise again, I understand. But I’m going to open my heart again to you, Todd Phillips. Please treat it gently.